The continuing battle for the Castle Combe circuit's three championships enters its most crucial phase over the weekend of August 13th and 14th. With two opportunities to score points the double headers may prove decisive for the drivers as the year moves towards a close. All three championships have a number of drivers capable of taking top honours, but with only two rounds left after this weekend, all of them will be looking to maximise their points, with the caveat that reliability can be as important as speed. Retaining a healthy but still vulnerable lead in the Castle Combe Formula Ford 1600 championship is Rob Hall in the Swift SC10. In theory, there are a dozen drivers who could mathematically still depose him, but in reality, the fight is between a handful of contenders. Run by the Swift Cooper team next door to the circuit, Hall's car/driver speed 'combo', has rarely been exceeded this year, the last time being at the previous meeting courtesy of the 'guesting' Ben Norton from Bratton. Before then it was Steven Jensen from Saltford in the Spectrum 011 who took a pair of wins at the televised meeting in May and he remains the strongest numerical threat. Adam Higgins from Chippenham is the only class B runner in with a realistic shout of the overall title in the well sorted family RF90 Van Diemen. Nathan Ward in the local Swift Cooper and Bradford on Avon's David Vivian in the Wiltshire College run Swift will try to take as many points away as possible, the latter with the handicap of a bent car after the last meeting. Luke Cooper, of the Swift Cooper fraternity from Yatton Keynell is also close enough to annoy them. There are other class A drivers who can take some of those valuable points too. Showing his old capabilities are ready to be unleashed is Ed Moore from Melksham, who took an incredible fourth overall in the last race despite having virtually no steering lock on his Ray GR11. Roger Orgee from Langford in the Van Diemen RF00 and Bath's Chris Acton in the Ray GRS08 are other class A players. Nick Charles from Yate is the man with possibly the healthiest lead in the circuit's championships, heading the saloon cars with more than a win in hand and having the experience of claiming the honours last year. His task varies depending on who shows in class B to challenge his Peugeot 106. Whilst Charles is capable of running right at the front, it's only class victories which count, so settling for those would be understandable given he has now proved his pace against the A class machines. Of those, it's Tony Dolley from Bridgwater in the 206 who is on good form and way ahead on points from a plethora of locals, including Bristol's Mark Wyatt in the Astra, Atworth's Rob Ballard in the SEAT Cupra and Trowbridge's Mark Funnell in the Mini which defied logic again last time by making the podium. Class C has a new leader, with Nick Clark loving his Suzuki Swift and making life tough for Will Burns from Weston Super Mare in the Fiesta. Five drivers are within range of the Castle Combe Sports and GT championship title, but with that useful extra point is Simon Tilling in the powerful Radical SR3. Chippenham's Ian Hall, who celebrated his 45th anniversary of racing at Castle Combe last time out, is the man who has to close that gap in the class B Darrian Wildcat with 5.3 litres behind him. Wrington's Darcy Smith in the Nemesis RME 98 is not far away and a double winner this year, whilst the Dursley based Wayne Poole Racing team looks after Bath drivers Guy Parr, also in a Nemesis, and Des Andrews in the MegaHart 001. Bristol's Tim Woodman would welcome some opposition to his Caterham in class C. Staying with Caterhams, there are three races for the 'Graduates' on Saturday, where a mix of road going 'Sevens' in varying states of tune, are closely matched in competition. The 100th Caterham race at Castle Combe will take place on Sunday, welcoming any kind of 'Seven' and with a prize of £100 to the winner. Over the years, many star names have competed in Caterhams at the circuit, perhaps the biggest being Le Mans winner David Brabham in 1994. Many of the contenders in the circuit's Sports and GT races will also try their hand in the BRSCC Open Sports Car championship race. Tilling's Radical will be pitched against the unlimited sports protypes, making for a potentially fascinating contest. Also on Saturday is the BARC Tran-X Classic Clubmans Championship for the interesting front engined devices. Swindon's Rob Beazer has his Mallock Mk 18 in class B. Completing the programme on Sunday are Sports 2000s and Formula Free, for unlimited capacity single seaters. Saturday's action starts with qualifying at 08:35. Racing gets under way from 12.00, with a break for lunch from 12:30 to 13:30. Sunday morning starts with qualifying at 09-30, with the first race at 11:00. Admission prices are on Saturday, £8 for Adults, £4.00 for OAPs, Paddock Transfer free and on Sunday, £15 for Adults, £7.50 for OAPs, £2-50 for Paddock Transfer, whilst accompanied children under 16 are admitted free on both days. 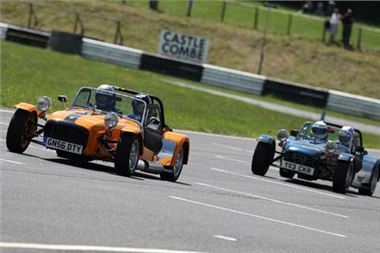 For further information, find the Castle Combe Circuit online at www.castlecombecircuit.co.uk, on Facebook or Twitter.